What should you use when sending or receiving money from abroad? It should be common knowledge by now that whenever you're transferring money abroad, remitting through your bank is seldom the best solution, given the higher fees charged. The exchange rate is usually less favourable (compared to Google), and a service fee is imposed for the transfer, which therefore reduces your capital being sent across. So how do you know what's the best to use for your money transfers / remittances? Simple, check how much you receive on the other side. 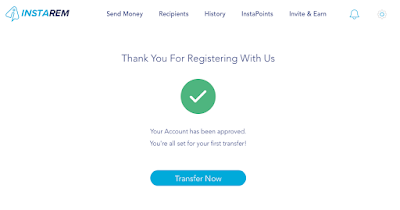 InstaReM (short for Instant Remittance). Currently ranked as the most cost-effective money transfer service in a number of corridors originating from Asia in the World Bank's Remittance Price Worldwide database, InstaReM could now be one good option for exchange students, parents sending money to their children studying abroad, foreign workers, and businesses alike who deal with overseas suppliers. Of course, in this gig economy, freelancers working for overseas businesses / websites will benefit greatly from using InstaReM to send and receive payments. The Singapore-based remittance start-up promising to be the new market challenger has investors so convinced, that they've managed to raise over USD 63 million well ahead of its expected IPO in 2021. Quite comparable, but at this moment (even without the coupon code), InstaReM gives me more bang for my buck to send my money through them. In short, its user interface is easy-to-use and straightforward enough, and their partner network with over 8000+ banks is how they're able to offer low fees across borders as quickly as 1 or 2 business days. Yes. 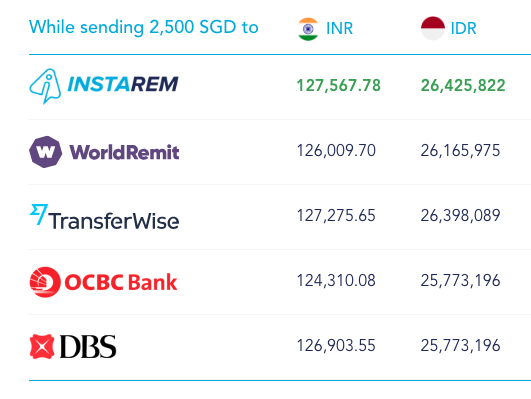 Currently powering payments for 3 of the top 10 South-east Asian banks, InstaReM already has regulatory licenses and approvals to send money from Singapore, Malaysia, India, Hong Kong, Australia, United States, Canada and Europe. 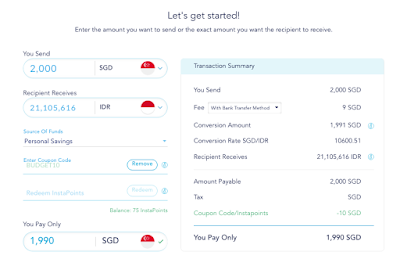 Through InstaReM, you'll be able to send money to India, Malaysia, Philippines, Indonesia, and over 50+ other countries across the globe. They're also currently in the midst of getting approvals for Indonesia and Japan (target completion by March 2019). Much lower than the banks. Similar to TransferWise, InstaReM offers mid-market rates sourced directly from Reuters and does not add any margins on forex (FX) rates at all. Instead, a nominal fee (between 0.25% - 1%) is charged to cover the costs of processing the transactions. 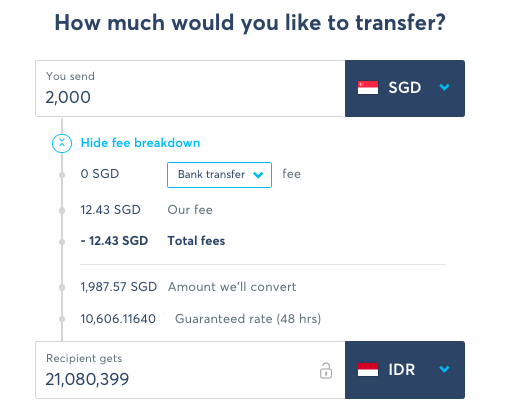 The larger your amount being sent abroad, the lower the fee, and anything above $10,000 in a single transfer is charged at a flat fee of 0.25% (the lowest). InstaReM also offers a rewards system where you can earn InstaPoints on every transaction and successful referral. You can then use your accumulated points to earn a bonus on your subsequent transactions. If you're a first-time user transferring any amount higher than $500, you can also key in BUDGET10 to get a $10 bonus on your first transaction. For Singaporeans and PRs, you can simply sign up using your SingPass credentials. 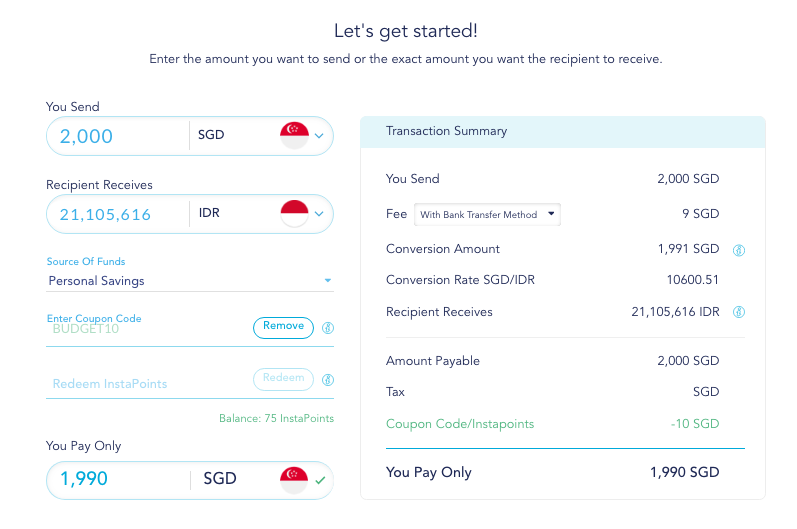 InstaReM is regulated by the Monetary Authority of Singapore (MAS), so you can be rest assured that there are regulatory controls in place to safeguard your money against any misdemeanors or transgressions. Once you've signed up for an account and have been approved, you can start transferring money abroad easily. Personally, I would recommend that you opt for the SingPass MyInfo registration if you're uncomfortable with uploading the front and back copy of your NRIC for verification. 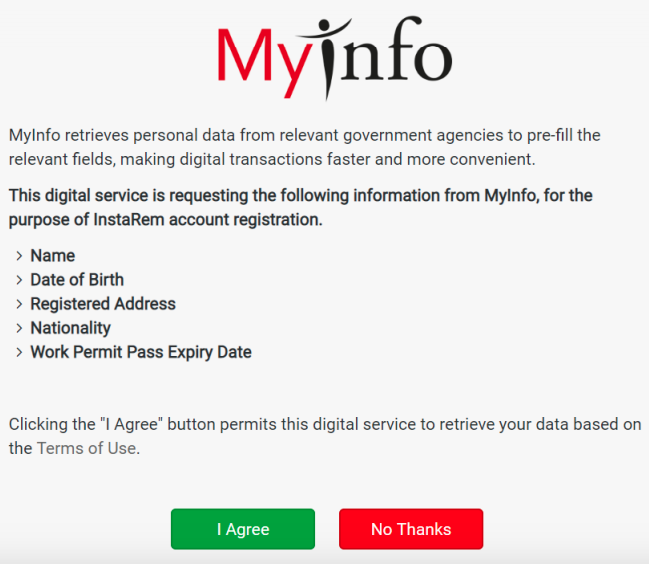 With this method, you also get instant account approval instead of having to wait for the InstaReM team to manually approve your documents. Next, click on "Initiate Transfer". Key in the amount you wish to send / receive on the other side, and add any promo codes (BUDGET10) or redeem InstaPoints here. You'll be able to see the conversion amount and a breakdown of all the fees involved before you proceed. Once you've filled in your recipient's bank details, authorize and confirm the payment request through OTP verification. Finally, click on "Take Me to the Bank's Website" and add InstaReM as a new payee. Transfer the money and mention the transaction number in the description box. So go ahead and compare the fees for yourself here, and I hope this helps all of you who have ever needed to deal with sending or receiving money from abroad! Click here to try out InstaReM now. Disclaimer: This post contains affiliate links. In line with my advertising policy (which you can review here), I only promote and recommend stuff that I personally benefit from AND which I feel my readers will get great value from. 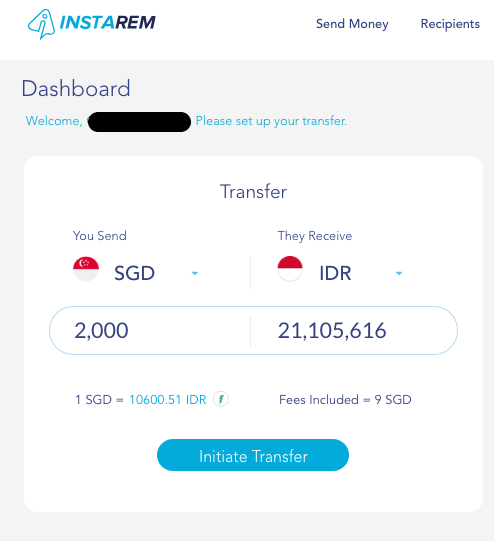 Until the next challenger appears on the scene, InstaReM is one of the options I would recommend right now to anyone looking to send or receive money from abroad.